The issue of Climate Change took centre stage during DCU’s latest Green Day last week. DCU’s Green Committee ran several different events throughout the day to highlight the issue including a rediscovery bike workshop, a composting workshop, and a seminar on Climate Change by Dr Matthew Jebb, Director of the National Botanic gardens. The Grow Your Own Society and the Environmental Society organised a cake sale and raffle which raised over €175 in aid of Irish Seed Saver and there was also a free food voucher for the first ten students dressed entirely in green to enter the NuBar. Dr Stephen Daniels planted a tree in memory of Nelson Mandela to mark the launch of the Community Heroes’ Garden. The Green Committee said that the purpose of the initiatives were to “demonstrate what individuals can do to address the existential issue of Climate Change”. DCU Students’ Union Welfare Officer Lorna Finnegan commented that the day was a huge success. “There were some great ways to get involved, all the while creating awareness around sustainability. There were also some great talks organised on the topic of climate change. Hopefully, the event will continue to grow in the future,” she added. The next Green Day will take place March 25th and the theme will be water sustainability. 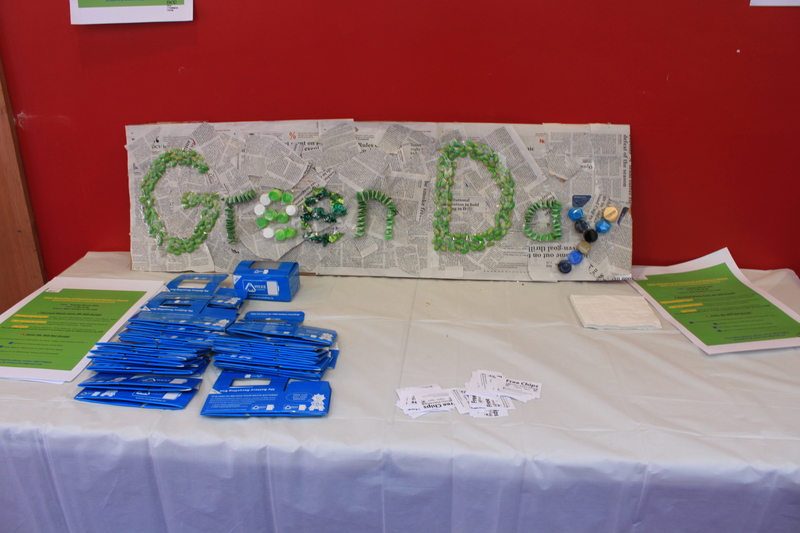 “We are planning a major recycling event for Green Day three,” said the Green Committee. For students looking to get involved in DCU Sustainability before then, a clean-up will take place on February 19th in local community estates. Students can contact the Environmental Society to get involved. The SU are also launching a new initiative with DCU Sustainability called BYOC – Bring Your Own Cup. “Basically if you bring your own travel mug, cup or flask – anything – you will receive a discount on any hot beverage in the Zest cafe in the Sports Centre, SPAR and the main restaurant,” said Finnegan.